The Highlands are filled with bens (mountains), glens (valleys), and lochs (lakes), most of which have several hundreds of years of stories to go with them. Clans and kings, religious leaders and Viking conquests, faeries, heroic acts, betrayals, and lots of cattle thieving make for great storytelling. Many of the tales are true, but a great deal of them are not. Even so, they are a lot of fun. 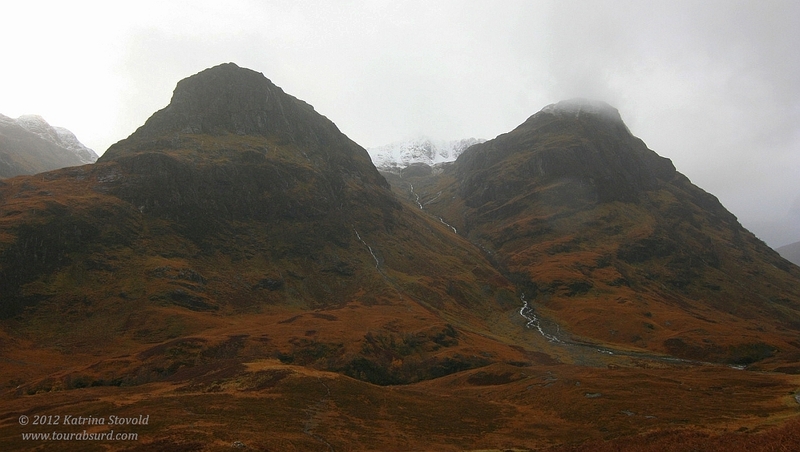 In Glencoe (also spelled "Glen Coe") there are three peaks known as the "Three Sisters". Elsewhere in the Highlands are the Five Sisters, another set of peaks, who were once known as the Seven Sisters – the youngest two were swept off their feet by two handsome Irishmen – but that is a tale for a different day. We stopped to take some photos. Just prior to our arrival, we had been told some of the more dramatic history of the region. The way our guide told it, the clan chief of the MacDonalds got lost on his way to pledge his support for the new monarchs, William and Mary. (It was January, so you can imagine the weather was not at its finest.) He eventually arrived at the meeting place two days late. The bureaucrat types who were in charge of the signing said, "Oh, go on, then. Don't worry about the deadline. Just sign the thing and we'll call it good." So he made his mark then headed back to Donald territory. If you read the BBC link about it, you'll see that it was a bit more complex than that, but who am I to get in the way of good storytelling? Thing is, the higher ups got bent of shape (foreshadowing Edinburgh as the financial center it is today, hmm?) and decided to make an example of Clan MacDonald over the tardiness. Nevermind the pledge – they were late! Didn't help that the MacDonalds had a reputation as cattle rustlers and bandits. In any case, a bunch of Campbells were sent to put an end to the MacDonalds. They arrived and sought shelter under the pretense of Highland hospitality. The MacDonalds dutifully let them in, sheltered and fed them, treated them like family – for TWELVE DAYS. On the night of a terrible blizzard, the Campbell soldiers were given their orders and set about killing the MacDonalds while they slept. There is speculation that some of the soldiers warned their hosts, as breaking the code in such a manner was considered absolutely appalling. The next morning, 38 MacDonalds lay dead, while most of the others fled up a pass to a hidden valley. 40 more died of exposure along the way. Political careers were destroyed, the flames of the Jacobite uprisings were fanned for many years to come, and the Campbell name was forever tarnished. Third sister off to the left there. The valley between these two is where the Campbells fled, or so they say. The betrayal still reverberates to this day, with articles about Scotland's "Murder Under Trust" laws being brought up, people carrying the Campbell name still bearing the weight of suspicion, and sayings like, "Never shall a Campbell be sheltered under a MacDonald roof" (paraphrasing here) being spouted. One of the most amusing tales – possibly a tall one – is about that famous American singer, Glen Campbell. 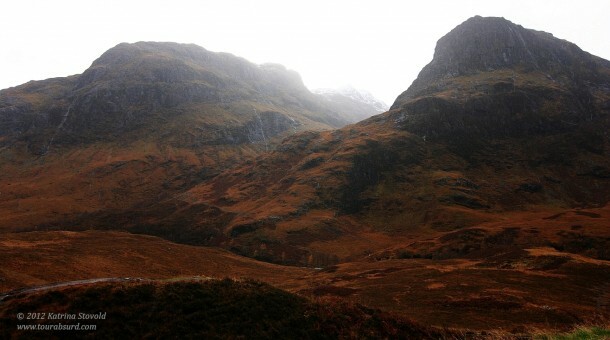 According to Eddie, our driver/guide, Mr. Campbell was visiting Scotland and the Glencoe area. He and his entourage pulled into an inn run by a man whose last name was MacDonald. Much to Mr. Campbell's surprise, he was refused lodging. "Being American", said Eddie, "he sued the proprietor." The judge's last name happened to be Campbell, which could lead you to suspect he'd be prejudiced. Turns out he was, but not in the way you might think: he ruled in favor of Mr. MacDonald! Yep, the judge was biased, all right, but in favor of well known Scottish tradition. No MacDonald need ever shelter a Campbell! I've no idea if this is true, but Eddie certainly made an entertaining tale out of it. I'd hate to go up against Scottish tradition! What about you? Gone head to head with any moral codes lately? Thank you to our driver/guide, Eddie, of Rabbie's Trailburners for this fantastic story! Agree, Debbie. I used to find history a dry and boring subject, but now I can’t get enough of it. I really enjoyed this post! Not only are you making me want to visit the Scottish Highlands, but I also learned something new – the Campbell/Macdonald rivalry! Never heard of it before. Oh, thank goodness! After I posted this I got so many, “Oh, yeah, I love that one!” kind of responses that I thought I was the only one on the planet who hadn’t heard of it before. Thank you, Tom. Just make sure that when you visit Scotland you swing through Ireland first. And bring me some tteokbokki. This is on my bucket list for sure ~ brother-in-law went two years ago and loved it. Great post..
Glad you liked it, David. I’m really glad I had the tour as an intro. I love road trips and am definitely planning to go back and do a self-guided tour some time, but having all the stories and bits of history pointed out was a fabulous way to get hooked. However you end up going, have a wonderful time! Scotland is a very nice place. Been there when I was studying as an undergraduate in England, experience the food, saw the wide open land & go into the big castles. Very lovely. But the deepest impression left on me was the food. The special “blood pudding” is certain one of them. Certainly like to go there often, when time permit. Yeah, here in Ireland there is black and white pudding, with the “black” being the local equivalent of blood pudding in Scotland. I have to admit, I liked the Scottish version better! I always enjoy reading up on Scottish heritage. My ancestors migrated from Scotland. Thanks for the great read! Thanks, Anthony! If you haven’t visited before, I highly recommend it. Sadly, I only had a few days in the Highlands. I recommend allowing a week, at least! Thank you Katrina, for a wonderful read as well as a great lesson in Scottish history. My father was born in Hawick Scotland and we grew up in Houston where we were part of the Heather & Thistle Society. Glendinning is a sept of the Douglas clan so we were too small to actually have any traditions to violate, but I can certainly verify that the Scots are adamant about tradition! I was a member of the Caledonian & St. Andrews Society in Seattle many years ago. Introduced me to Scottish Country Dance. This was my first trip to Scotland, however. If you haven’t yet gone, I hope you do. It’s so beautiful! I’ve been there myself. It’s a great experience. I was looking forward to relaxing at home after this trip, but I think I left part of my heart in the Highlands. Must go back!